Western blot analysis of extracts from HeLa cells, transfected with 100 nM SignalSilence® Control siRNA (Unconjugated) #6568 (-), SignalSilence® Axl siRNA I (+) or SignalSilence® Axl siRNA II #6264 (+), using Axl (C2B12) Rabbit mAb #4939 (upper) or α-Tubulin (11H10) Rabbit mAb #2125 (lower). 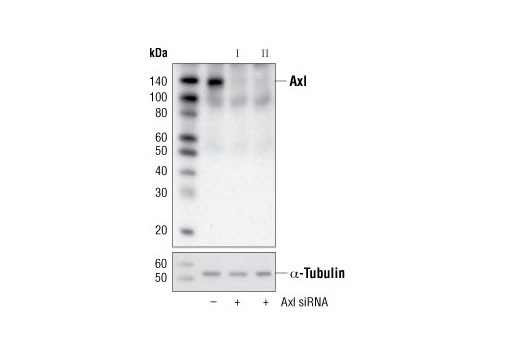 The Axl (C2B12) Rabbit mAb confirms silencing of Axl expression, while the α-Tubulin (11H10) Rabbit mAb is used as a loading control. CST recommends transfection with 100 nM Axl siRNA I 48 to 72 hours prior to cell lysis. For transfection procedure, follow protocol provided by the transfection reagent manufacturer. Please feel free to contact CST with any questions on use. SignalSilence® Axl siRNA I from Cell Signaling Technology (CST) allows the researcher to specifically inhibit Axl expression using RNA interference, a method whereby gene expression can be selectively silenced through the delivery of double stranded RNA molecules into the cell. All SignalSilence® siRNA products from CST are rigorously tested in-house and have been shown to reduce target protein expression by western analysis. Axl, Sky, and Mer are three members of a receptor tyrosine kinase (RTK) family that share a conserved intracellular tyrosine kinase domain and an extracellular domain similar to those seen in cell adhesion molecules. These RTKs bind the vitamin K-dependent protein growth-arrest-specific 6 (Gas6), which is structurally related to the protein S anticoagulation factor (1). Upon binding to its receptor, Gas6 activates phosphatidylinositol 3-kinase (PI3K) and its downstream targets Akt and S6K, as well as NF-κB (2,3). A large body of evidence supports a role for Gas6/Axl signaling in cell growth and survival in normal and cancer cells (4). Crosier, K.E. and Crosier, P.S. (1997) Pathology 29, 131-5. Demarchi, F. et al. (2001) J Biol Chem 276, 31738-44. Lee, W.P. et al. (2002) Oncogene 21, 329-36. Bellosta, P. et al. (1997) Oncogene 15, 2387-97.